I have been forming my own views about Landscape Urbanism and am looking to raise a discussion within the Academy of Urbanism and beyond. Do people agree with me? If so, how do we respond? If not, why not? “If you have a culture that is fundamentally automobile-based, then an urban model that is anti-automobile is counterintuitive at best. There’s a strange precept these days that asserts that people will abandon their cars if we simply build cities that don’t accommodate them”. Interim uses eg temporary food production. How can this be coded? Layouts need to be walkable and workable. Working with the grain of nature. GRABS – green and blue spaces. “It was good to find out about a new academic threat to good sense, and I very much agree with your doubts about the universal value of green space. 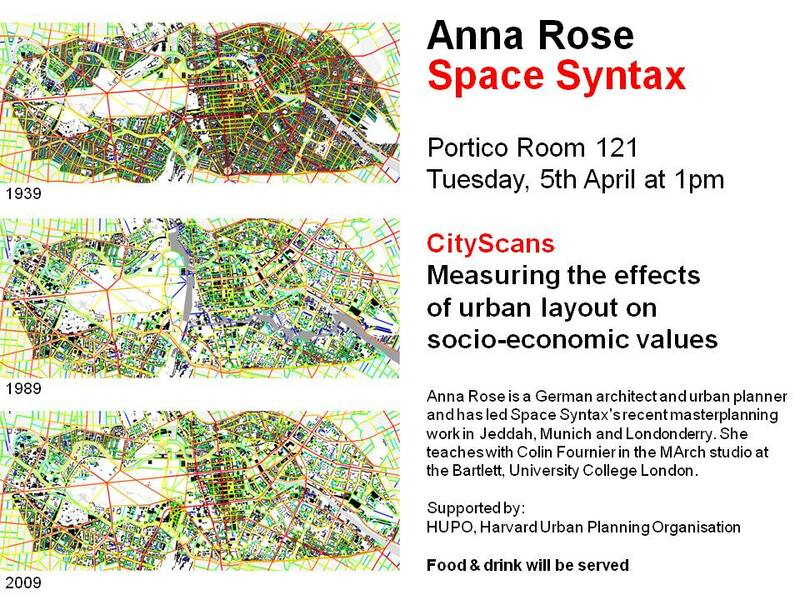 On Tuesday, 5th April, Space Syntax director Anna Rose gave a talk at the Harvard GSD on the use of Space Syntax in planning and urban design. She began by describing Berlin’s spatial transformation during the 20th century, showing graphically how the connected heart of pre-war Berlin was then divided by the Wall and later reconnected with Reunification. Anna then offered some thoughts on how the Potsdamerplatz development, including the Kulturforum, could be spatially replanned to better connect these important cultural and economic assets into the movement network of the wider city. Finally, she showed how Space Syntax techniques work at the smaller scale of urban design, with the case of Old Market Square in Nottingham, where the design concept emerged from a spatial analysis of the site and its urban setting. Anna Rose is a German architect and urban planner and has led Space Syntax’s recent masterplanning work in Jeddah, Munich and Londonderry. She teaches with Colin Fournier in the MArch studio at the Bartlett, University College London. Anna’s work is featured in the recent issue of Arch+. She recently gave a presentation of the Berlin CityScans project at the Berlin Kulturforum. Good afternoon. I am delighted to have this opportunity to report on my progress as this year’s Lincoln Loeb Fellow. My brief today is in two parts: first, to describe my work as an architect and urban planner at the strategic consulting company, Space Syntax Limited; second, to say something about where I think my practice, and the field generally, is heading. In doing so, I want to make special reference to new technologies and new methods of communication that have emerged in recent years. 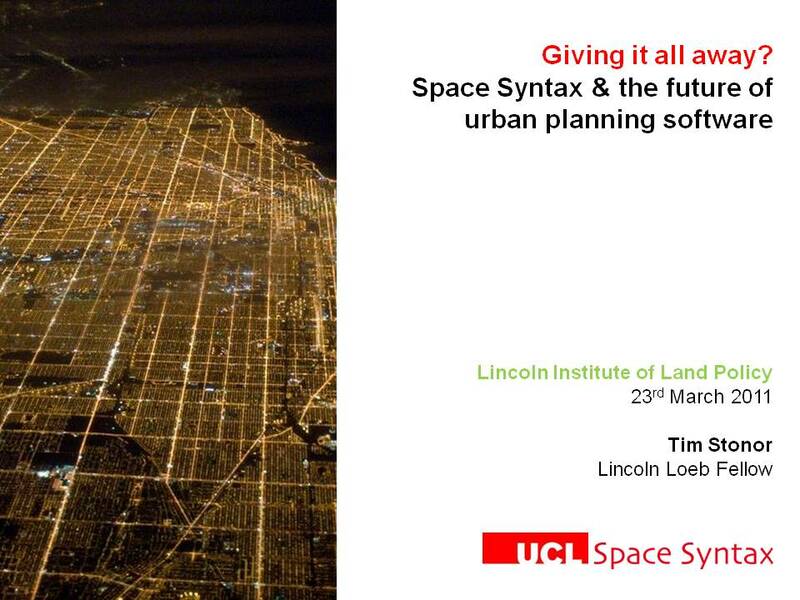 “Space Syntax” is an evidence-based approach to planning and design, with a focus on the role of spatial networks in shaping patterns of social and economic transaction. First developed at University College London, it explains, scientifically, why the continuously connected city is a good thing and it exposes the risks that come from sprawl and disconnection. It has much to say about the benefits of density and the hazards of urban fragmentation. It gets us away from simplistic banners like “New Urbanism” or “Landscape Urbanism” by providing a detailed, forensic description of the city. Space Syntax is best known in the UK but, over the last fifteen years, we have established a network of Space Syntax consulting companies to take the approach into a growing number of countries. Although not immune to the ebbs and flows of the market, we have a commercially successful operation. Yet, in collaboration with UCL, we now plan to make it available at low or no cost, to as many people as are willing to take it up. More than that, we are about to open up the “source code” of the software to anyone who wants to get their hands on it. We are, in other words, about to publish the recipe for our secret sauce.